Even though it’s the middle of September, I’m still not quite into fall mode yet since I live in the desert, but I’m slowly making my way out of summer mode and this last week I started to get the itch to make more wintery things like scarves and hats and mittens. 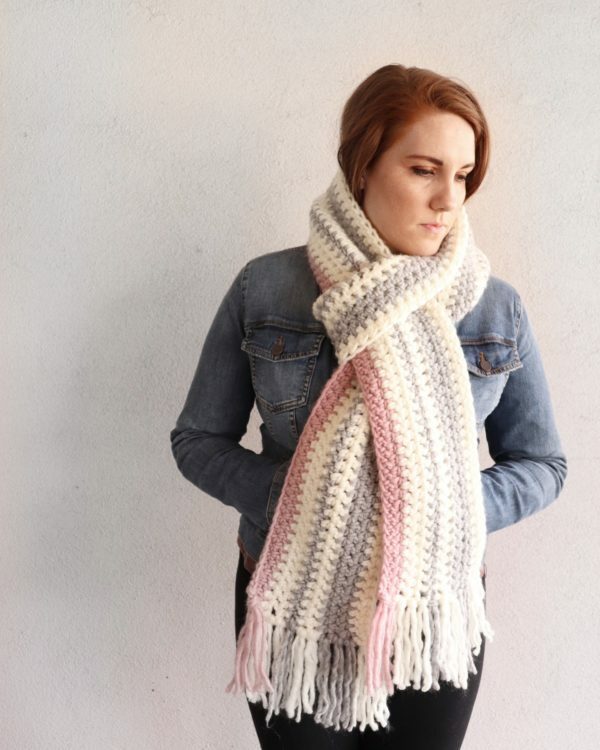 I saw a really lovely pink and gray striped scarf when I was shopping at H & M last week and I knew right away that I would love to make a crochet version. And luckily I happened to have some leftover Bernat Roving yarn in the exact right colors! I decided to try out a new modified way to work half double crochet my mom came up with a few months ago, and I really enjoyed working the stitch, even though I didn’t realize until it was half way through how jagged the striped lines were going to turn out. I don’t think they look bad, I had just envisioned the lines straighter in my head so I probably didn’t pick the right stitch for what I was going for, but I still like how it turned out anyway. And the good thing is that I can always make another version with a straighter stitch :). We haven’t quite figured out what to call this new half double crochet modification, but the best way to describe it is Half Double Crochet Working in Between the Posts. 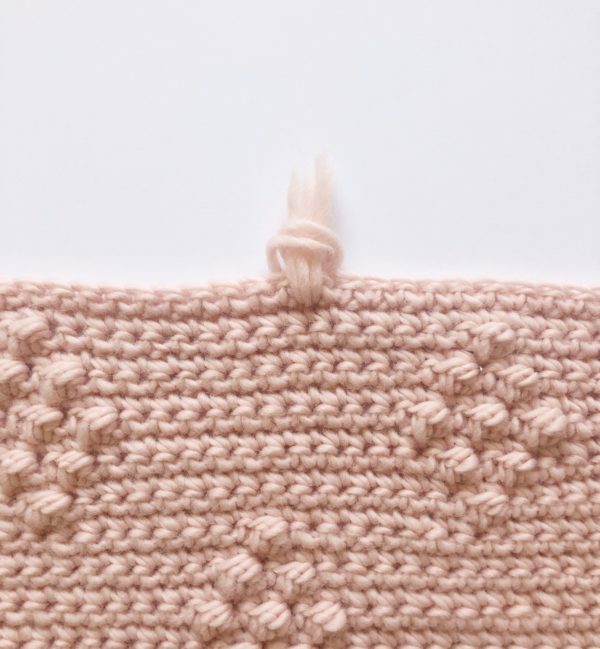 You work the stitch exactly the same as a half double crochet, except instead of inserting your hook underneath the top two loops, you insert your hook underneath all three loops, so that your hook is in between the two posts of the stitches from the row below. 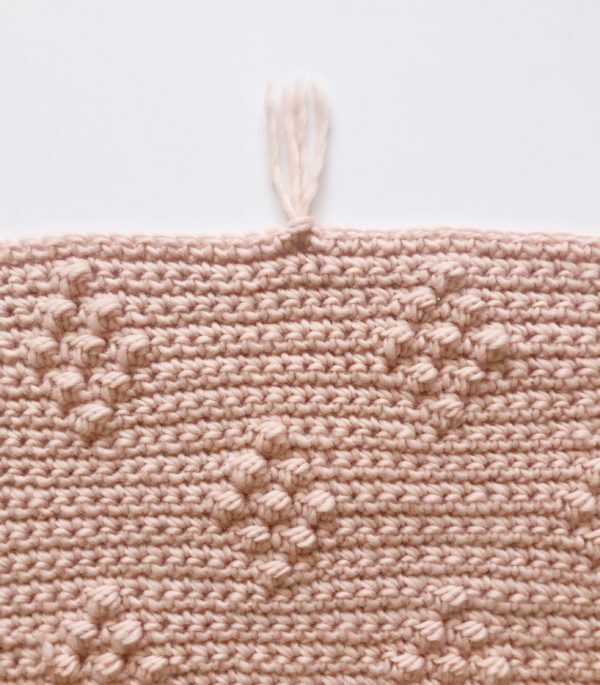 Here is a video you can watch that demonstrates the stitch in case that doesn’t make sense! In the third chain from the hook, half double crochet (HDC). Half double crochet in all the chains across. When you reach the last chain, chain 2 and turn. HDC (working in between the posts) across the row. When you reach the last stitch, pull through with Rice Paper (you should have three loops on your hook when you pull through). Then chain 2 and turn. Work 3 rows of HDC (working in between the posts) in Rice Paper, then work 1 row in Putty, 2 rows in Rice Paper, 3 rows in Putty, 2 rows in Rice Paper. When I finished the scarf, I wove in all the ends with a tapestry needle and tied on some simple tassels. 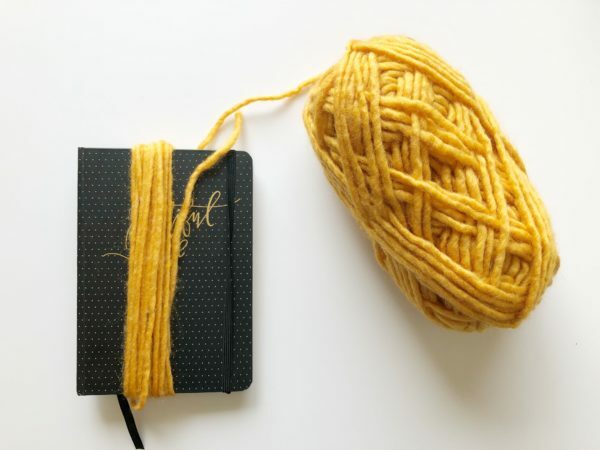 Wrap a piece of yarn around the notebook. Cut the yarn in half. Take two pieces of yarn and fold them in half. Insert the folded end into the chain space. You can use your fingers or a large crochet hook to do this. You can space your tassels out however close (I chose to do one for each row) and you can trim them to your desired length. I hope you enjoy making this crochet gray and pink striped scarf! For those of who you have been following the Farm for a while, you know that my mom started crocheting a few years ago hoping that maybe one of her projects would be gifted to a forthcoming grandchild. That still hasn’t happened yet and over the past year we’ve received so many nice comments and many people letting me know they are praying for me and I just wanted to let you all know how much I really appreciate your kindness. Earlier this year we found out that I actually have endometriosis that is causing some blockages and probably the main reason why we haven’t been able to get pregnant on our own yet. There are a few things that can be done to try to get rid of endometriosis, but most doctors these days recommend jumping straight to artificial treatments since trying to get rid of endometriosis can sometimes cause more scarring or damage and then you end up having to do things artificially anyway. I know that’s not true for everyone, but I think that’s kind of the common thinking these days in the infertility world. Anyway, my husband and I aren’t opposed to using artificial treatments, but we just don’t feel like it’s quite the right time yet for us. Since we got married really young, I still feel like I have a few years before I need to start panicking, and there is still always a chance (even if a very slim one) that we could conceive on our own. I know everyone deals with this issue in their own way and some people would think we are crazy for wanting to keep waiting before pursuing more treatments, but it’s what we feel is best for us right now. This is probably more info than anyone really wants to know, but along with the many kind messages we’ve received, we’ve also had a lot of messages from those of you who are dealing with infertility or miscarriages yourselves and I really appreciate your willingness to share your own struggles. Infertility is such a tricky thing to talk about, especially when you have friends who are doing their best to do the really hard job of raising kids and you don’t want to minimize their struggles by sharing your own and inadvertently send the message that they shouldn’t complain because at least they have kids at all. And then on the other side of the coin you don’t want to make people feel guilty for sharing good things about their kids because they feel like it might hurt your feelings. As I’ve dealt with this issue for the past several years I’ve gone through times where I thought it would be easier to just distance myself from my friends who have kids because its probably easier on them and me, but the older I get the less friends I have who don’t have kids, and I’ve had to learn that I can’t just interact with people who make me comfortable. In every relationship there will always be something that one person has that the other person doesn’t and I think one of the greatest tests we all have to endure as humans is to learn how to love other people despite all the unfairness. It’s a really hard skill to develop and one that will probably take me a lifetime to figure out, but it’s one of those things that I probably wouldn’t have realized I needed to learn if it weren’t for my infertility. Anyway, right now I’m just trying to live one day at a time and I’m grateful for the opportunity this blog has given me to focus on being creative and keeping me busy. Neither my mom or I are professional crocheters (looking at my scarf you’re probably like, ‘um, we can definitely tell’ ha ha)– but we just like to share the patterns for the things we make so others can make them and so we can have them written down if we ever want to make them again. 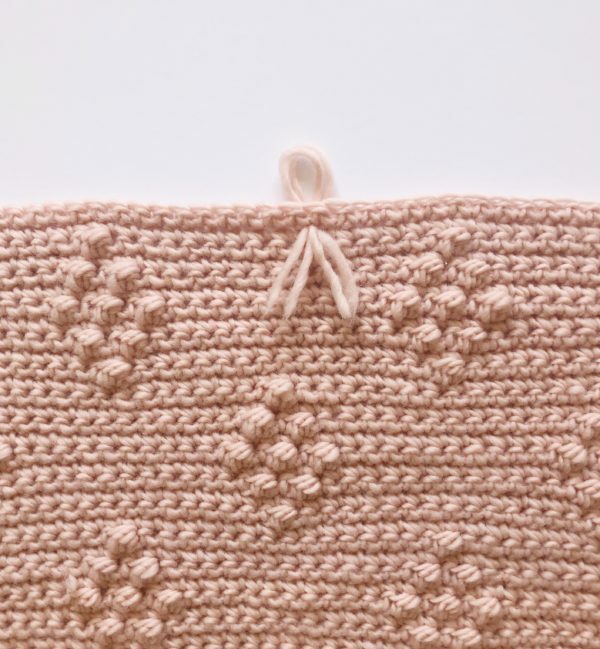 Sometimes I get a little tinge of regret when we give away one of our baby blankets as a gift and I think ‘wait, what if I want that for my child!’ but the good thing is that we have all the patterns written down so we can always make them again :).